We could not find “all sharks likely to be found in America Samoa” but here is one of our favorites, the Galapagos Shark! Although we are a bit late to celebrate… we are very excited about new regulations passed in American Samoa protecting a number of marine species! The law too effect on November 11th – and it is now illegal to catch or even possess any species of shark! 4. any species of shark anywhere in the territory or territorial waters. Territorial waters extend 3 nautical miles from the shoreline. All sizes and ages and any parts are fully protected, at all times, everywhere in the territory (That means shark fins are banned!). These regulations are the most powerful protection for sharks in the USA, and provide the only protection for the other three reef fish within the USA, except for where all fish are protected. The National Ocean Policy will build on regional tools like the Northeast Ocean Portal. We’ve been attending the first meeting of the Northeast Regional Planning Body of the National Ocean Policy over the last two days. There is a lot of confusion and jargon around the National Ocean Policy and ocean planning in general, but ultimately these groups will be the ones determining how our oceans are managed for decades to come. It’s a huge mandate and one that we think it’s important to understand, so we thought we’d answer a few questions about what all this means. What is the National Ocean Policy anyway? The National Ocean Policy is a framework that aims to strengthen ocean governance and coordination, establish guiding principles for ocean management, and adopt a flexible framework for effective coastal and marine spatial planning to address conservation, economic activity, user conflict, and sustainable use of the ocean, our coasts and the Great Lakes. For more information on the National Ocean Policy, see our Ocean Watch Essay on the subject. And what about these Regional Planning Bodies? There are 9 regions throughout the country, each one tasked with working from the bottom up to interpret and implement the NOP in the ways that will be most effective for their region. RPB’s are made up of Federal, State and Tribal representatives. How stakeholders and other parties are engaged will be determined by each of the regional bodies. What will be the exact outcomes of the National Ocean Policy? Regions will determine the scope, scale and content of plan, as well as the final product so this may vary widely throughout the country. This is driven by the needs, interests and capacity of each region, building on existing programs and initiatives. Outcomes could range from data tools intended to help with ocean management (e.g. maps comprehensively characterizing marine space) to large scale marine spatial planning efforts (see more about marine spatial planning in our previous blog posts here and here). This meeting here in the Northeast is the first RPB meeting in the country, and it’s very apparent that there is no road map for what is being done. Locally, however, Massachusetts and Rhode Island have both implemented their own comprehensive ocean planning that the NE Region hopes to build on as a whole. Wait, I’m still confused. Why does the National Ocean Policy matter again? Our good friend Richard Nelson, a lobsterman from Friendship, ME, says it best, “The obvious answers, of course, are that the ocean is our our workplace, our cultural heritage, and economically sustains us and our extended communities as it has for generations. Those of us who work on the ocean day to day live with the effects of small changes in climate and observe changes in habitat, all of which may be evident in our catch rates or how species progress through seasonal cycles. We are also solely dependent on a healthy resource that must be managed intelligently and effectively while remaining accessible to us.” Read his whole article here. Electronic Motor wins marine design award! The 22nd Annual Design Award for the Marine Trade Show Competition recently concluded. We are very excited to see the overall winner of the awards was an electric motor! 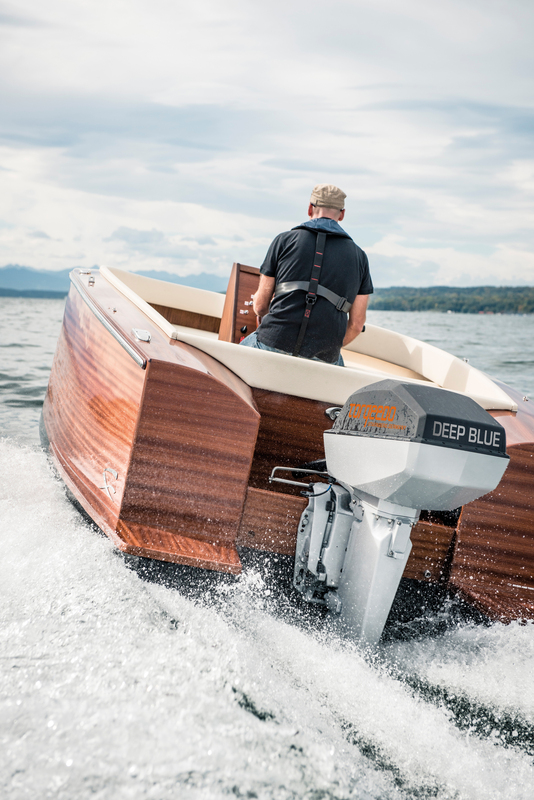 The Torqeedo for the Deep Blue Electronic Outboard premiered this month and is the latest advancement from this innovative company. Torqeedo also offers smaller outboards for dinghies and lightweight boats. They also have solar panels that can charge the engines battery so you do not have to rely on plugging in. This latest engine however could allow larger power boats – such as race committee boats – to make the switch to electric! Tell us – would you purchase an electronic motor for your boat? Perhaps it is the Nor’easter blowing cold wind through our office windows… but winterizing boats is on our mind today. We have complied some tips from two great resources, our past Ocean Watch Essay – Winterizing Your Boat, and CZ-Tip – Boat Winterizing—Keep It Green. Click on either link for the full list – or read out highlights below. Support the Clean Marinas initiative by switching to a marina that follows these standards, or changing your marina to follow these standards. Got Sewage? – Sewage holding tanks should be emptied before winter storage. List with links by state for pump-out services here. Oily bilge water is a hazardous waste, so before emptying, place an oil absorbent pad/sock (available at marine supply stores) in the bilge to capture all oily waste, then have your marina pump out the clean water. If doing it yourself, use absorbents to remove all visible oil and pump bilge water onto the ground away from storm drains and water bodies. As you dream about next season’s boating season – or if you are one of the lucky ones preparing to head south – consider copper free bottom paint! Also by making a donation to Sailors for the Sea – you get a discount at ePaint. Share below: what is your best tip for winterizing? The Sea Otter High School Regatta was hosted by Monterey Peninsula Yacht Club on October 13 & 14. This was the second year the event was run as a Clean Regatta and a pod of Risso’s Dolphins swam by to show their gratitude to the sailors! Additionally the superintendent of the Monterey Bay National Marine Sanctuary, Paul Michel, spoke at the skippers meeting about the importance of protecting our oceans. The event was certified at the bronze level and below is a highlight of the Clean Regatta Best Practices implemented this year. Water bottle Reduction: Sailors were encouraged to bring reusable water bottles and refill at provided water stations. Last year, sailors were given reusable bottles and hopefully used them again this year! Green Team: Volunteers helped encourage proper recycling, and walked the beach to remove any trash. Trash Free Regatta: The local college sailing team (CSUMB) sold lunches to sailors and used very little (if any) disposable plastic in the lunches. Recycling: Recycling bins were put out along the beach, the boat storage yard and down the wharf. Paper Reduction: Paperless registration through Regatta Network. Regatta awards: Beanies were given out as regatta awards these practical trophies can be a nice way to reduce waste. The perpetual trophy (of an otter) was donated by the Monterey Bay National Marine Sanctuary last year and is reused every year. A few more photos from the event by Liz Chandler, an event organizer, unless otherwise noted.